Raise a Glass: Fine Wines and Spirits Auction at Skinner | Skinner Inc. 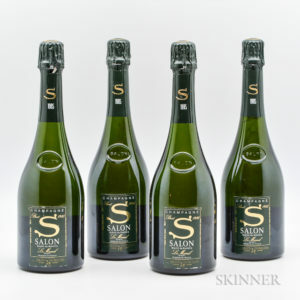 Champagne Salon, 1985 (Lot 14, 4 bottles, estimate $2,000-$2,800), an astounding wine made entirely in the style of Blanc de Blancs. As it is only bottled from the best vintages, cellar master Michel Faurconnet can ensure that exacting standards are met. Chateau Margaux, 1990 (Lot 305A, 12 bottles, estimate $8,000-$10,000). This “gorgeous” “sensual” wine received 100 points from N. Martin for TWA. The rare spirits offered in this sale are worthy companions to the outstanding wines. There are choice beverages both old and new and as always some special and rare bottlings. 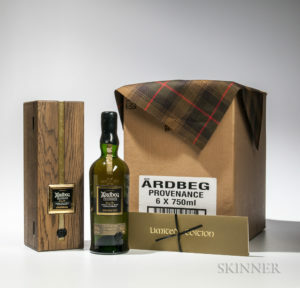 The oldest whisky is a Laphroaig, distilled in 1960 (Lot 432, estimate $3,000-4,000) and bottled in 2000 at the life-beginning age of 40. A pint of OFC (Lot 445, estimate $800-1,000) was distilled by The George T Stagg Distillery before Prohibition in 1916 and bottled after Prohibition in 1933. Additionally, there is a robust selection from the modern classics such as the Van Winkle and Buffalo Trace Antique Collection lines. This auction continues the Skinner tradition of scrupulously researched fine wines and rare spirits. Each lot offers an opportunity to brighten the depths of winter and delight the discriminating palate. This entry was posted in News and tagged fine wines, french wine, Italian wine, new world wine, port, rare spirits, whisky, wine auction by Kerry Shrives. Bookmark the permalink.